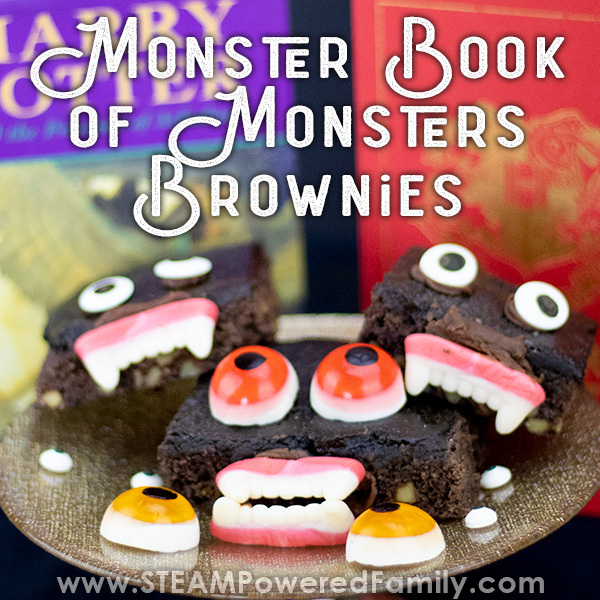 The Monster Book of Monsters Brownies - Ready to bite! Don’t let the teeth and eyes scare you! 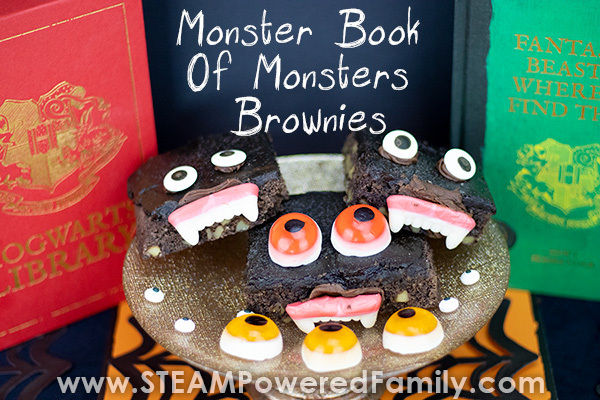 This Monster Book of Monsters Brownie recipe is one of the best brownies I have ever tasted. The fact that they look like the Monster Book of Monsters from Hagrid’s Care of Magical Creatures class, just makes them super cool. Who can ever forget the book that attacks and fights back in Prisoner of Azkaban? Harry ends up having to tie his book shut with a belt after jumping on it to stop it biting. Talk about a memorable book! This required reading for Care of Magical Creatures has all the students worked right up as they tried to wrangle and wrestle their books. We all know Hagrid would never do anything to hurt anyone, so it’s not surprising the solution to controlling the books was simple. All the students had to do to calm the snapping teeth of the book was “stroke the spine”. We love Hagrid and his Care of Magical Creatures class is one of our favourites. And of all the cool books in the world of Harry Potter, this might be one of the most memorable! 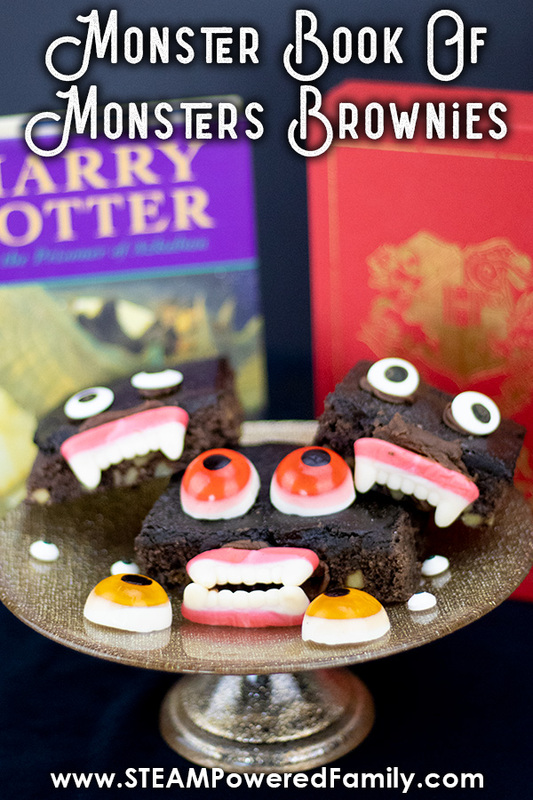 So when we were looking for a new idea to celebrate our love of Harry Potter, we thought these Monster Book Brownies were perfect! As I do with so many of my amazing recipes for kids, I asked my mom for her help with this project. Once again she didn’t disappoint! My mom is a firm believer that we need to make our recipes and projects the best they can be. That means using the best ingredients and ensuring the taste is outstanding. And the kids LOVE decorating their very own Book of Monsters. It makes a great change to always decorating cookies. This recipe will make 8 4×4 brownies or 2 8×8 brownie cakes. In a small saucepan melt the butter and cocoa stirring gently. Take off of the heat when melted. In a bowl carefully mix the eggs, flour, sugar, salt and walnuts until just combined. Don’t over mix. Combine the eggs mixture with the butter mixture from the saucepan. Mix gently. Split the mixture between two 8 inch square pans which have been buttered. Cook for about 30 minutes or until the brownie starts to pull away from the edge of the pan. In a small bowl mix all the ingredients together and beat with a spoon until smooth. When the brownies are cooked turn them out of their pans and spread them with the icing while they are still warm. 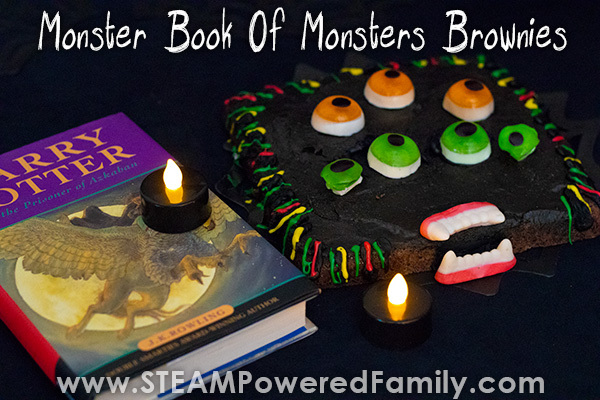 Bringing the Monster Book of Monsters to Life! This is the part kids love the most, decorating their Monster Book of Monsters so it looks ready to bite! You can leave the brownies large or cut them into smaller pieces. The choice is yours. 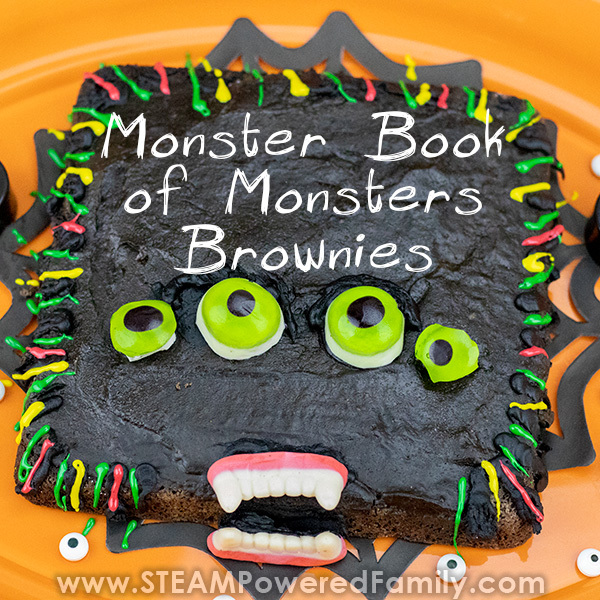 Use cookie icing to attach the eyes and teeth, and icing pens to decorate your Monster Book of Monsters exactly the way you want. 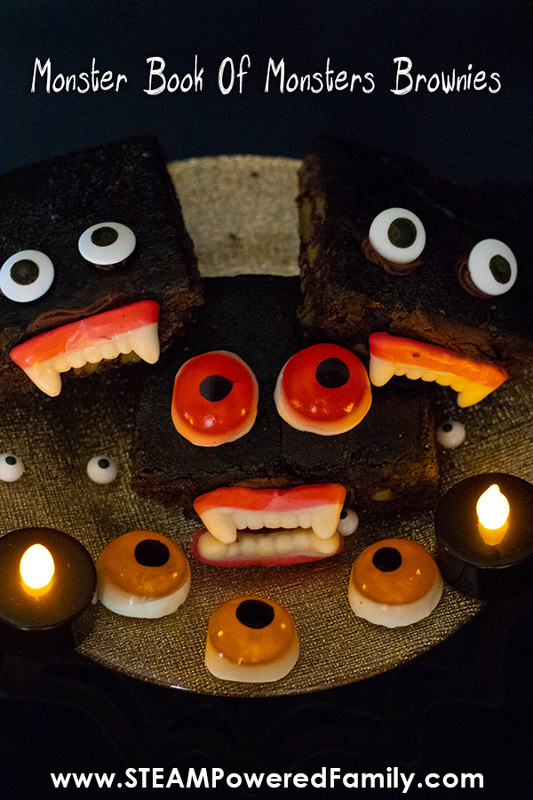 These brownies are great for a Harry Potter Party or for Halloween. The best part, these brownies are so good! !